We specialize in the sale of kitchen utensils for both professional chefs and home cooks. Along with lots of unique tools, our Philadelphia store includes a full selection of cookware, cutlery and many thousands more quality products than you will find on our website. We try to provide you with concise information about all our products, together with many guides and manuals. We do our best to always provide good quality, good value, and personal support - even after the sale. Fante's is a family owned and operated retail business, located in the heart of Philadelphia's historic Italian market since 1906. 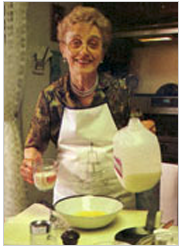 A renowned Philadelphia tradition, Fante's is nationally acknowledged as one of the finest in the housewares industry. Over the years, Fante's continues to receive recognition from countless newspaper, magazine and web articles, as well as from food related programs on television and radio. Famous chefs and cookbook writers make it a point to stop at the original Italian Market store when in Philadelphia, and you'll find Fante's listed as a resource in many of their books. Mariella, family members and staff welcome you to our store, where we are always happy to offer you our helpful knowledge and expertise. Many of us have been with the company more than a quarter century, and a number of us have backgrounds in the field of foodservice. Mariella, our President, and everyone's mother and sister, manages our staff of usually about two dozen people. Most live in our immediate neighborhood, work full-time and receive vacation, and other benefits. Our hours of operation reflect the family nature of our business. Although we, like all humans, are not perfect, we know that we couldn't do without you, so we always do our best to fix our mistakes, and to treat you with the respect that you and all of us rightly deserve. Really!